I can happily report she’s come a long way in our nine months together, with some skills sharper than others. (Isn’t that true of us all?) She’s happy, eager for adventures every day, and sweet-natured to boot. She’s a terrific guard dog who keeps us company no matter what we’re doing, and even keeps track of Buddy the Cat, whose bramble patch adventures will appear in Dangerous Deeds (book 2 of the Waterside Kennels series). As you can see from the photo above, we’re making good progress with the stand-stay command. We’re also doing well with sit-stay and down-stay, which I’m using to discourage her from lunging toward vehicles as they pass by. Sasha is perfectly agreeable to having strangers approach in pet-friendly stores, out on the trail, or in the park. She’s even polite to strangers walking through the neighborhood, although she’ll almost always have something to say to them as they approach. The test requires the dog show no sign of resentment or shyness, but there’s no (apparent) requirement to be silent. That’s good news for my talkative girl! I’ve been coaching her on this one for a while. She’s okay with adults provided they don’t run up and thrust a hand in her face or grab her. (And really, who likes that?) She’s calm with strollers and toddlers, a bit cautious around older boys, and tends to stare at kids on bikes and scooters as though trying to figure out what they’re doing. Thanks to the fabulous work of master groomer Alicia Broyles of Towne and Kountry Grooming and Dr. Hynes and Dr. Stropes of Crossover Veterinary Clinic, Sasha is calm and polite when standing for examination (and that’s why we practice the stand-stay). She doesn’t mind her ears being checked and quickly mastered the foot command–my own invention motivated by the need to wipe the mud off her feet after outdoor play time. Sasha is smart and knows the difference between walking on the leash and having the long line clipped on, which is her signal to forget heeling and just have fun. Once on the leash, though, and she’s (mostly) a well-mannered dog who enjoys adding her own running commentary of mutters and low-voiced yips, yodels, and the ocassional bark. With the farmer’s market off the square for the winter, we’re relying on pet-friendly stores and the area parks for crowd work. Our local Lowes home improvement store has a pet-loving manager and a friendly crew, so we make a point of browsing there frequently. This has also proved good practice for the “sitting politely for petting” test. When other dogs react by barking or lunging, Sasha just sits or stands quietly at my side. I follow the same protocol at PetSmart, but that’s due to inattentive owners with dogs on extended leashes. Neither Sasha nor I are fans of those leashes, but she enjoys our time there because she’s allowed to browse the items on the shelves! The test involves a distance of 10 feet, but we practice using the 30′ long line as well as the 6′ standard leash. Our challenge here is to have a consistent and reliable recall despite distractions. For Sasha, those distractions can be squirrels, birds, airplanes, passing vehicles, etc. This one is definitely a work in progress. As the test is described, “The dogs should show no more than casual interest in each other. Neither dog should go to the other dog or its handler.” We haven’t reached the “casual interest” stage. In the neighborhood, Sasha is on alert but interested: head up, tail up, body language and vocalization signaling excited interest. The other challenge is that the neighborhood dogs always want to get up-close-and-too-personal with Sasha. We need to spend more time out of the neighborhood and along the lake trail, which is popular with dog walkers. I’ll gradually decrease the distances between us and the others. I’ll note, though, that Sasha participated in the annual Dog Walk back in May and handled being in a crowd of people and dogs with no problem at all. More practice needed here. Any suggestions? Sasha is comfortable with the down-stay as long as I’m in sight. This test, however, has me going out of sight for three minutes. So far, we haven’t made it past one minute. The test description also says that the dog “does not have to stay in position but should not continually bark, whine, or pace unnecessarily, or show anything stronger than mild agitation or nervousness.” She won’t bark or pace unnecessarily, but she does have that tendency toward a running commentary, even if it’s quiet. I’m open to suggestions here, as well! All in all, we’re both making reasonably good progress, and I’m looking forward to mastering the CGC and moving on to new canine challenges! This entry was posted in American Kennel Club, Dogs!, Home page, Training and tagged American Kennel Club, Canine Good Citizen, Dogs, Training. Bookmark the permalink. Bettylouise, the CGC has been around since 1989 (I think!) but it wasn’t considered a title until just a few years ago. While the CD is only for purebred dogs eligible for AKC competition, the CGC is for all dogs. Sasha is a purebred but I didn’t receive her official AKC registration papers when she came to me. 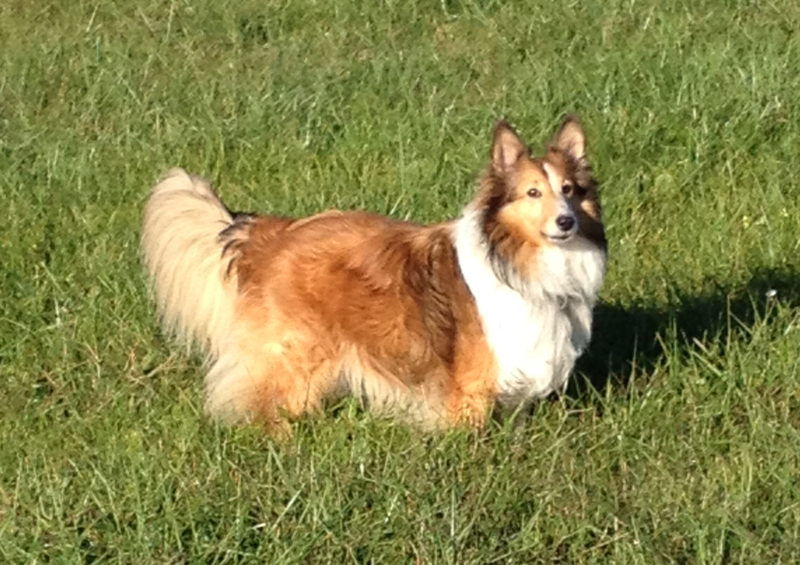 She’s now recognized by the AKC through their Purebred Alternative Listing program so we can compete. if all goes well, we’ll try Rally Obedience in the coming year! lab and Visla. Of couse, the puppies look like labs and they were sold as such, but without papers. i WANT YO PURCHASE THIS BOOK, ? Nancy, book #2 is in the pipeline, I promise! Does Sasha have a “leave it” command? That is what we use with our service dogs when we need/want them to either no touch something, someone or to ignore an environmental distraction. I suspect Sasha is bright enough to learn leave it and generalize the command to a variety of situations. My boy recently lost his hearing. It is quite a challenge to convert all of his known verbal commands to hand signals. Seems we each have new challenges to master with our beautiful dogs. Sasha does indeed know the “leave it” command and we use it often in the house. She’s also good with it on walks when we want her to stop sniffing, or to stop her attempts to herd the ducks at the pond. I have not (yet!) been successful in getting her to generalize the command to meeting dogs, though. Any tips for encouraging her in that direction? Distractions can be tough to over come. I am facing this very thing. We just try to refocus back on to what we were working on. It can take some time to do sometimes!